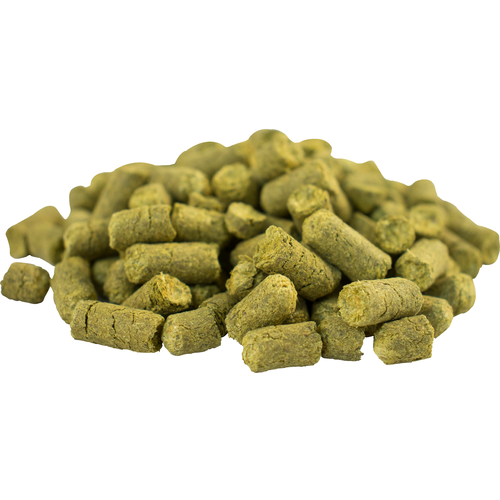 AMARILLO® hops have become super popular with microbrewers. Brewers are describing the flavor and aroma as a supercharged version of Cascade. Floral, tropical, and citrus (lemon, orange and grapefruit) characteristics. However, it has a distinctive Orange character to it that is very different from Cascade. Supply has been very limited the last few years so make sure to buy some while it is available. Crazy good price/reviews and I don't have any on-hand now. What year Amarillo is this? BEST ANSWER: Hi Kelly - The crop year for this hop is 2017. These hops are great if you want a citrus smell and flavor for your beer. The are mostly orange which is a nice change to the lemon and grapefruit of other citrus hops. I really like the resealable package this comes in. Very professional . These had an extremely fresh aroma when received, but not too vegetable or grassy. This is now my favorite hop. Great by itself, or in combination with others for any hoppy beer! I use this for most of my IPAs. I always pair it with cascade on my wheat.........I can't brew it without it, great for it's aroma. Used 8oz of this is my 10gal IPA. Perfect! Love it. First time using these hops with a wheat beer. Will definitely use again. I use these primarily as a bittering hop in my clone recipes. Occasionally as an aroma addition because its described as flowery, spicy and citrus-like with a distinct orange bouquet. One of the best hops around! What's not to like about Amarillo? The orange/tangerine character is unique and a great compliment to other citrusy hops. I like to let Amarillo take the lead or even use it exclusively. Whenever I see a beer that features Amarillo, I'm definitely picking it up! No issue with these hops - always fresh. I like to substitute in place of cascade and centennial when they aren't available for my west coast IPAs. I usually love Amarillo and have gotten some good packets from morebeer but I have recently gotten two 2oz packages from morebeer that are super grassy. SO bad that they essentially destroyed two good beers with a dry hop addition. The first batch I thought may have just been due to possibly overhopping (2oz for 4 days dry hop in a 5% AVB beer) but I only added 1oz to the next 7% ABV IPA and it was grassy after only 24hr. More than a little irritated! I blame the hop farmer for harvesting unripe hops but morebeer shouldn't sell bunk hops. If you want to make an IPA with the flavor & aroma all us Hop Heads are looking for, you need to try these hops! Nice pair with cascade. Used it in a nice Pale Ale.